I awoke to an explosion of activity on the website this morning! The cause? 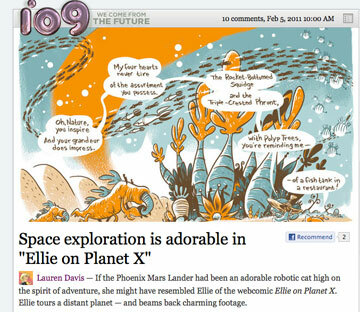 This cool article about Ellie on Planet X at io9.com, an online blog/magazine about sci-fi and the science related, leading a gang full of people this way. Now Ellie is charming and adorable. Thanks peeps at io9! Sweet Jim! This is great news for you. Much deserved too! Thanks Tom! I’m all goofy today!